The debate on appropriate methodologies for evaluating democracy support has gained momentum in the last two decades, in tandem with significant increases in democracy assistance. This debate has raised more questions than answers, including whether evaluation of democracy support differs or should differ from evaluation of other areas of development assistance; whether the diverse conceptions and definitions of democracy and democratization are an impediment to the sound evaluation of democracy support; whether there are ways in which the challenges of attribution and causality can be overcome in the evaluation of democracy support; and whether recent initiatives in the evaluating democracy support offer genuine steps forward. 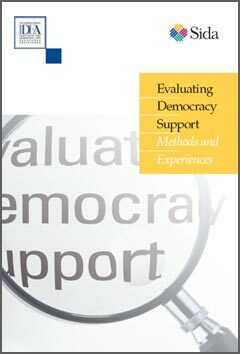 This book is based on the proceedings of a workshop on methods and experiences of evaluating democracy support, organized by International IDEA and the Swedish International Development Cooperation Agency (Sida), and held in April 2006. This book aims to share the main deliberations of the workshop and stimulate further debate. It includes new conceptualizations of methods and techniques for evaluating democracy support and points the way forward to potentially promising new developments.